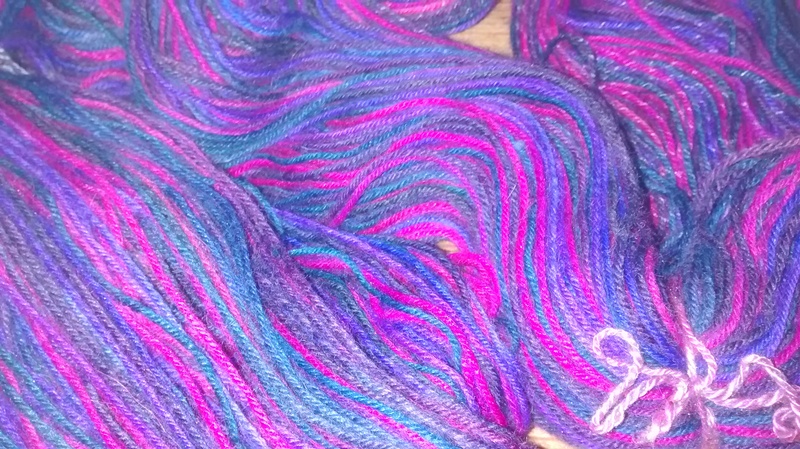 At our last Spinner’s Guild meeting we had a yarn dyeing workshop. I took along some undyed sock yarn that I’d been saving, that was a blend of merino, angora and nylon. I rarely buy yarn nowadays as I prefer to spin my own for bigger projects, but make an exception for sock yarn. Socks are often my travelling project – both car glove compartments hold an “emergency sock”- and a worthwhile sock yarn is a lot of worsted 3 or 4 ply spinning. I don’t think I’d have time to spin enough for my needs. I’ve been seduced in the past by beautiful hand dyed skeins that knit up into unattractive, blotchy socks with colours pooling in strange blobs. I know that some knitters love this but it’s not for me. I like stripes or really long subtle colour changes. With this in mind, I eschewed the wide choice of jewel colours on offer at the workshop and chose just pink and blue. 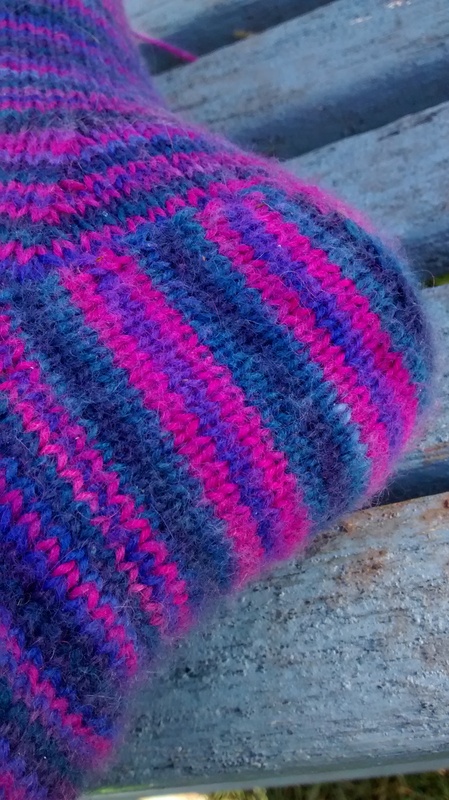 I imagined stripes of pink blending subtly through a gentle indigo to a nice clear blue stripe. My resolve wavered a little as I looked at the beautiful blends that others were doing. In comparison mine looked a bit flat and boring. It was okay, but I was feeling a little envious of the beautiful skeins that had started appearing on our Guild Facebook page. The “gentle indigo” I was hoping for where the two colours blended came out puce. Not my favourite colour by a long chalk. 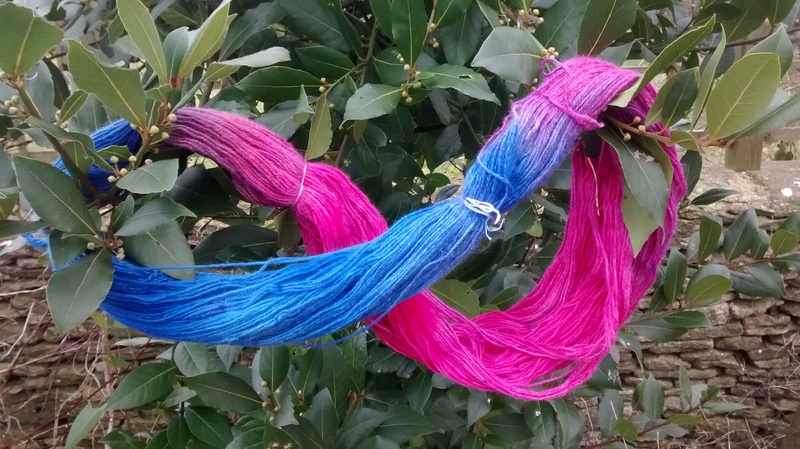 I hung the skein in a tree to make it look more interesting for its photo shoot! I decided to start knitting my socks before I gave my final verdict. Not a success. 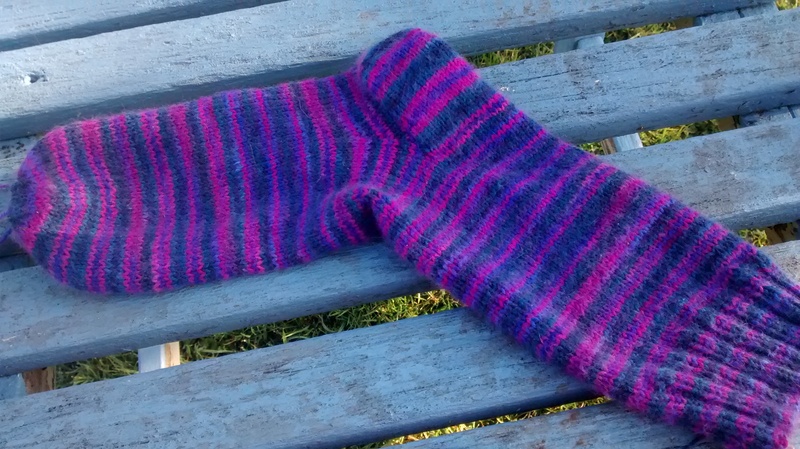 The stripes were one round wide, which made them look like a random mess, and the puce helpfully spiralled around the sock giving the only visible pattern. It didn’t take much knitting for me to decide that Something Must Be Done. I ripped out the knitting and re-skeined the yarn. 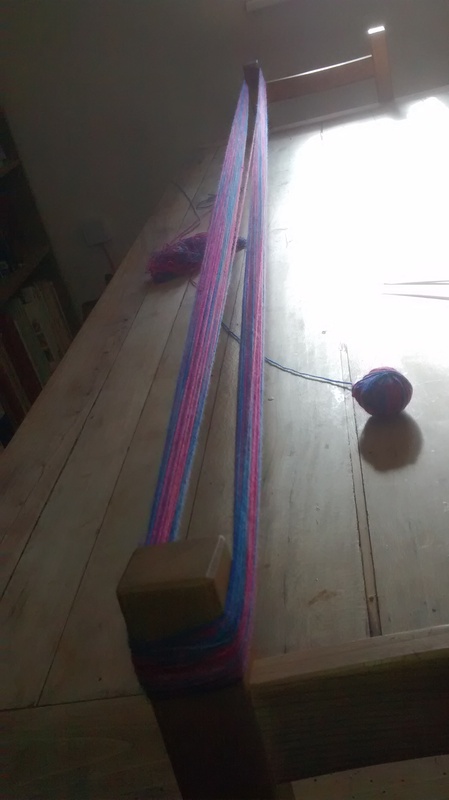 This time, I made a much longer skein – I used two chairs either side of the length of our dining table. This was 3 times the length of the original skein, so the theory was that my stripes would come out 3 rounds wide rather than a single round. 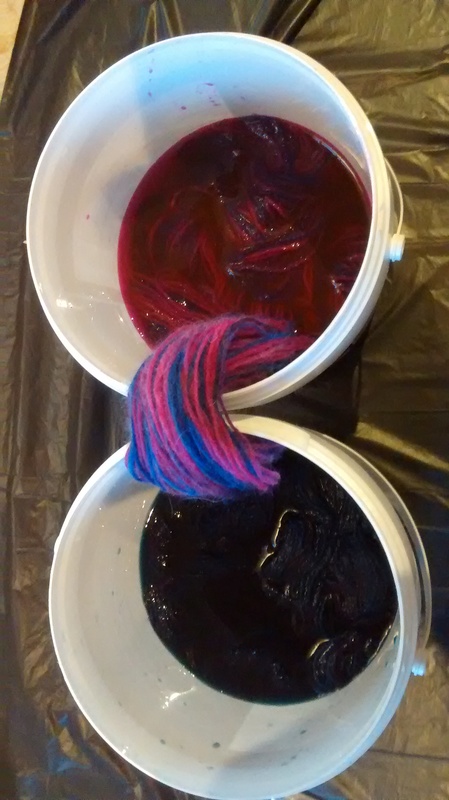 I mixed up some magenta dye and some blue dye and soaked the yarn in warm water again. I then dipped an end in each colour and squidged the dye where the 2 colours met. 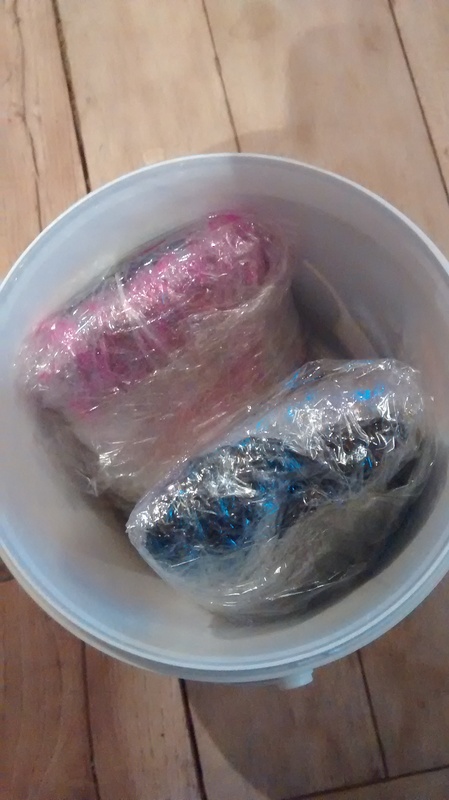 The package was then wrapped in clingfilm and microwaved for 8 minutes, turning the package over half way. I was much happier with the colours after this – the original blue bits went either darker blue or purple, the original pink bits went either deeper pink or violet. I finished by overdyeing the entire skein with a weaker magenta to blend all the colours a bit more (glad I used superwash yarn!). Rather than a “flat” yarn, I ended up with a multi-tonal skein that would hopefully still give stripes, but with a bit more interest than before – and without the puce spiral. The proof is in the knitting. I’ve finished one sock, but they’re not moving quickly as they’re rattling around in my handbag for when I have 5 minutes to kill. 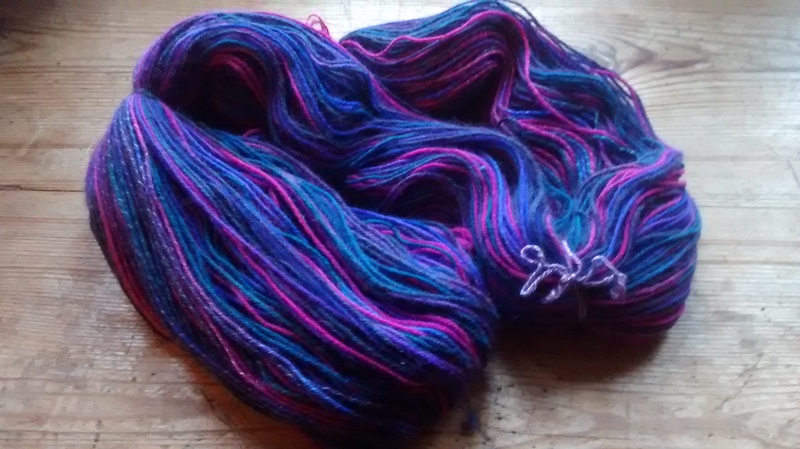 I’m much happier with the yarn now, and so pleased I didn’t settle for the original dye job. 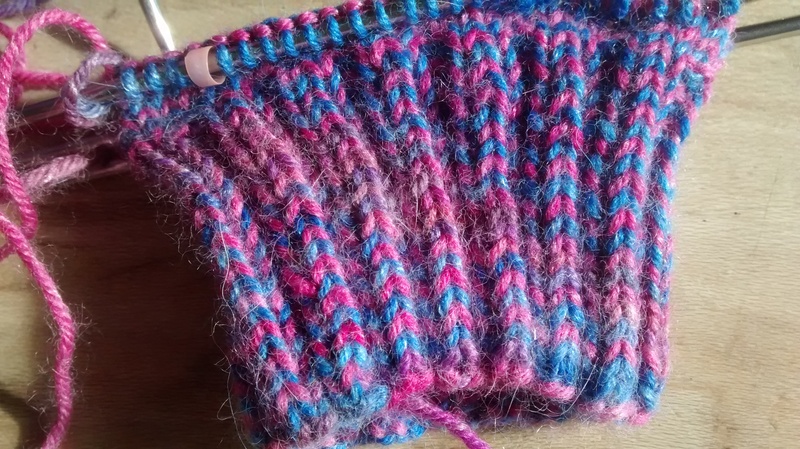 My favourite bit though is the heel – worked on half the stitches – a nice wide stripe – I’ll need to double the length of the skein again for my next attempt at dyeing. 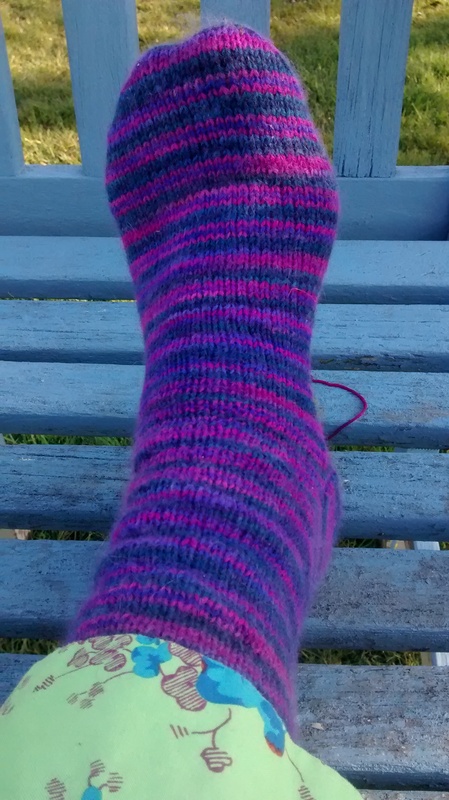 The sock pattern is my standard one – 60 stitches on 2.5mm needles with a rounded toe (first toe decrease, k 4 rounds, dec, k 3 rounds, dec, k2 rounds, dec, k1 round, dec every round to end). I use lovely Hiya Hiya needles which let me whizz around. Did you notice my stitch marker in the earlier photo? It’s a small piece of plastic drinking straw. I always use these for stitch markers on socks. I can never find stitch markers, and when I do they ping off and get lost all over the place. Using bits of straw means I only need take a straw and scissors and I have as many stitch markers as I need. It’s a top tip, not of my invention – I read it somewhere years ago and can’t remember where – thank you to whoever it was for saving me many frustrating hours excavating the sides of armchairs. I think these will be socks for me. Some of my socks are wearing quite thin now and will need to be either darned or frogged and the good bits re-knitted into something else. I’m still spinning the onion yarn, but I think I’m on target, and I’ve been experimenting with contact dyeing silk with varying degrees of success. I will save that for another day. Fantastic result! Thank you so much for sharing!! Thank you! Now I know how long I need the skein to be it should be easier next time. Of course, a few minutes of measuring before I started would have saved me a whole lot of messing around. Except that’s part of the fun! I love your socks! What a great dye job. Thanks! Took a while but got there in the end.